We'll be using more pimentos tomorrow and more beans on Monday. 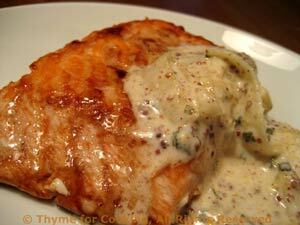 When roasting salmon, I line the baking sheet with foil and cook them, skin side down, without turning. When done, I slide them off the skin and on to the plates, leaving the skin behind on the foil to wrap up and toss. 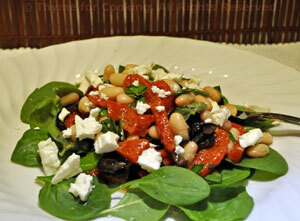 This is almost a pantry salad with white beans, pimentos or roasted red peppers from a jar and Greek olives. Get salad ready spinach and it's a snap. Open, drain and rinse beans. Refrigerate unused portion. Wash spinach if necessary, spin dry. Tear, if needed. Pit olives if needed, slice in half. The salad: In a medium bowl mix vinegar and mustard. Slowly add olive oil, whisking constantly until well combined. Add beans, chives, olives and peppers. Stir well to combine. Divide spinach and put on 2 plates. Top with salad, sprinkle with feta and serve. 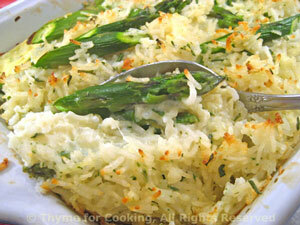 The asparagus is blanched before assembling the gratin, to help keep it's vibrant green color. Trim asparagus and cut into 2" (5cm) lengths. Blanch for 2 minutes in boiling water. Drain and refresh in very cold water. Add milk and tarragon, whisk to combine. When rice is done spread on a plate and allow to cool for 5 minutes. Add cheese, asparagus and rice to egg mixture. Stir to combine and spoon into baking dish.